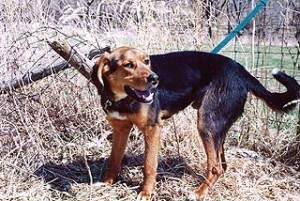 Dudley was the first dog saved by AWF. In the summer of 2002, two stray dogs wandered onto the property of an Oxford Mills couple. New to the area, the couple asked the neighbors if Jones County had an animal shelter. One neighbor said they should shoot the dogs and another suggested they call the sheriff’s office. They were so disgusted at the suggestion of shooting a dog they called the sheriff’s office only to learn that the nearest animal shelter was in Jackson County. They loaded the dogs into their van and delivered them to the shelter, where the owner claimed them several days later. They then went about their lives, focused on completing the house and moving in before winter. But in the back of their minds, the seed had been planted. In January 2003, having moved into their home in November, the couple were ready to find a way to help Jones County’s homeless animals. 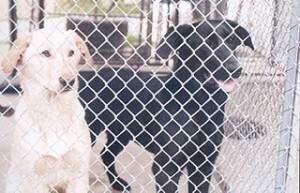 They were appalled to learn that nearly every stray dog picked up was euthanized. While each dog was held for seven days at one of three vet clinics in the county, which acted as dog pounds, people rarely came forward to claim a dog, resulting in the death of many. And while the county paid to have the dogs euthanized, they put no money or effort into finding homes for the stray dogs. Cats fared even worse–when someone called the sheriff’s office to report a stray cat, they were told the county did not pick up cats. Basically, the animals were left to starve or be shot or hit by a car. Being problem solvers by nature, they set out to do just that—find a solution for helping the homeless animals. On March 30, 2003, the couple incorporated Animal Welfare Friends (AWF) to help stray dogs and cats in eastern Iowa, with an emphasis on the homeless pets of Jones County. From the beginning, they wanted to build a safe haven for animals, but also provide a place for education and programs that celebrate the bond between animals and people. On March 30, 2004, AWF became a 501(c)(3) not-for-profit organization. Bonnie and Stella were among the 32 dogs saved by AWF its first year. At the time AWF was founded, Jones County had a procedure in place for picking up, holding and euthanizing dogs. So this is the place where the couple first focused their attention. Working in cooperation with Sheriff Mark Denniston and the county’s three vet clinics, the couple established a procedure that is still in effect today. When a stray dog is picked up by the county, an AWF volunteer takes digital photos of the “Urgent Dog” (so named because the dog may have only seven days to live), evaluates his/her personality, and sends the photos and written description to a volunteer who makes a flyer. The flyer is routed by e-mail to a group of over 200 people who print the flyer and post it in vet offices, grocery stores and businesses in four counties in an attempt to find the dog a home by the end of the seven day holding period. At the same time, an Urgent Team of volunteers networks via e-mail and phone to find an AWF foster home or a reputable animal shelter or rescue to take the dog in the event he/she is not adopted at the end of the seven days. While AWF was able to help a limited number of Jones County cats the first few years, the numbers were restricted due to difficulty in recruiting people willing to foster cats. That eventually changed, however, and the group was able to save 40 cats in 2007 and 50 cats in 2008, thanks to the efforts of a handful of cat-minded volunteers who joined AWF’s ranks. Today, AWF uses a network of state-licensed foster homes for dogs and cats as well as the Cat Adoption Center. It’s the dedication and commitment of our foster parents that allow us to save the orphaned animals of Jones County. We have saved over 1500 homeless dogs and cats. An amazing accomplishment when you consider we have no paid staff. In May 2006, AWF embarked on a campaign to raise funds to build an animal shelter in Jones County. Over the past 10 years, the organization has raised $246,544 towards this goal. “We know this is a tremendous accomplishment, but we still have a long way to go,” said Annie Locher, Monticello resident and former AWF board member. In March of 2009, AWF’s board of directors knew it needed to re-energize the organization’s shelter campaign. It hired Community Services Group in Omaha, Nebraska, to conduct a feasibility study on building an animal shelter in Jones County. In April and May 2009, over 40 community and business leaders were interviewed to determine whether there was support for a shelter and if so, identify individuals and businesses who are willing to lead or help in the effort. On June 25, a meeting was held at the Anamosa Library and Learning Center to present the findings to the public. Through this effort, AWF found an overwhelmingly positive response, so we were very pleased. Today, we’re determined to find land so we can move forward and have a place for all our animals under one roof. In 2012 AWF was able to make the first step to attaining the goal of building a shelter in Jones County. The organization purchased land to be used for construction of a shelter in Jones County. The land is located just north of Monticello at the intersection of Highway 151 and Business 151. This land is 8.68 acres that will provide a home for the animal shelter, a dog park and hopefully many other animal related events. And finally, in October of 2016, the shelter construction was completed and the shelter was open! We have been serving the animals of Jones County & beyond from the shelter ever since. We are the only and first shelter in the county, and are so proud to be able to help our community & their animals live healthy, safe, happy lives! Visit our Shelter Campaign page for the full story of our shelter’s construction.